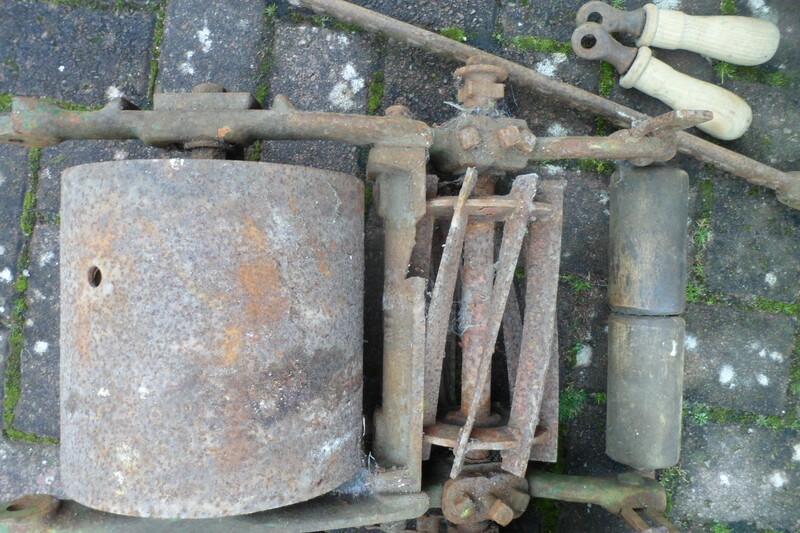 I was recently given an old hand mower by my friend, Robert Manton, who no longer has the time to restore it. The other handle: LEEDS AND LONDON. The blade measures about 9 inches or so. I found some notes about a similar mower on the ‘Old Lawnmower Club‘ web site. The model shown at the bottom of their page is very to my mower, so I have some idea of what I am trying to achieve. The red plate between the handles, just above the back roller is missing from my machine. The chain drive wheel is painted red, although mine is green. 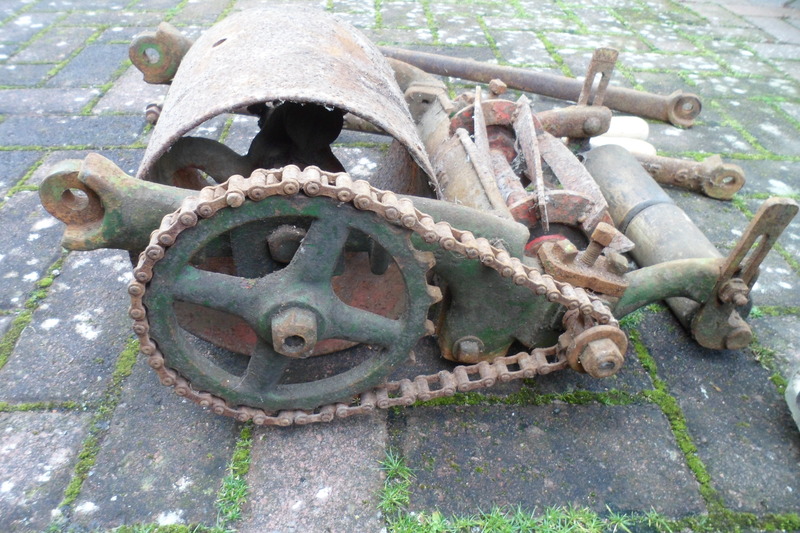 The chain is rusted solid and most of the machine needs to be dismantled and cleaned. I need a few replacement bolts to fix the handles back onto the mower body. The front roller refuses to rotate. A metal plate is missing. The plate near the blade has a large chunk missing. Certainly something to keep me busy whilst the weather is so wet and chilly. The handles were easy enough to clean. I used a rag soaked with WD40 to remove the general grime and then rubbed them down lightly with wire wool. The handles still have traces of a light green paint. I used a wire brush to remove the rust from the back roller and rubbed my rag over to clean it. The roller is an open cylinder. The inside seems to have been painted a dark red, whilst some of the fittings inside it are green. The blades and back roller moved a little before i started work. The front roller refuses to budge. I sprayed the chain with WD40 several times as I was working, but a few links are still not moving. I need to remove the chain and soak it in oil or diesel for a few days. The gear wheel next to the back roller that drives the chain was easy to clean and is painted green. I wire brushed the blades to get the rust off. They still show signs of red paint. I managed to get them rotate, which is a start. Sharpening them is another matter. the bottom plate looks in bad condition too. I rubbed the wooden hand grips smooth with wire wool. I now need to buy some Linseed oil to soak them. Very easy to do. The mower still has some of the original paint. I shall post more as the restoration proceeds!